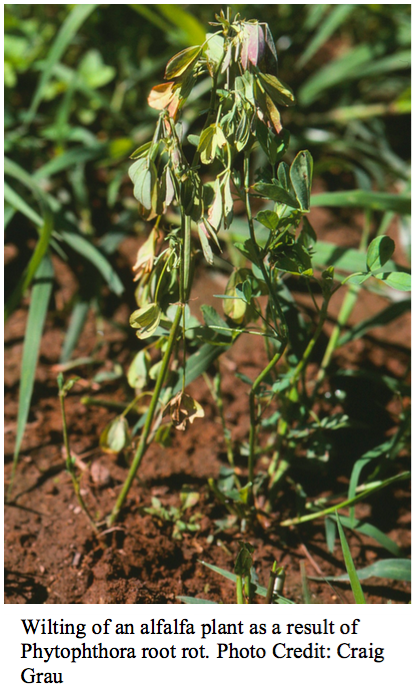 Pythiums are probably the most common cause of seedling blight and seed rot in alfalfa, destroying seeds before germination or killing seedlings after emergence. Phytophthora medicaginis can affect alfalfa plants at all stages of development and is probably the most common root rot pathogen of alfalfa. Damping off and root rots caused by Pythium and Phytophthora are most problematic in acidic, poorly drained soils with a high organic matter content, or when prolonged, wet weather follows planting. It is not uncommon for complete stand losses to occur within a few days in low areas of an infected field. Pythium ultimum and Pythium irregulare can infect alfalfa seeds, causing seed blight or rot (pre-emergence damping off), or they can cause water soaking and eventual death of the roots and stems of seedlings as they emerge (post-emergence damping off). Pythiums also cause damage to mature plants and are often referred to as ‘root nibblers’ because they destroy the fine roots of plants without causing noticeable decay yet leading to measurable yield reduction. Alfalfa plants infected by Phytophthora medicaginis appear stunted, yellow or reddish purple, and may be wilted. Infected taproots have tan to brown lesions, especially where a lateral taproot emerges. Lesions eventually turn black while the center of the root becomes yellow. Affected taproots are often pinched or damped-off immediately below the crown region, resulting in a ‘pencil-point’ look. When the roots are severely rotted the plants are easily pulled from the soil. Infected seedlings die rapidly, making it difficult to distinguish death caused by Phytophthora from that caused by Pythium. The taproot of Phytophthora-infected plants will be rotted and collapsed at any given point below the soil surface and only the small feeder roots of Pythium-infected plants rot. Phytophthora medicaginis, Pythium ultimum and Pythium irregulare are all soilborne pathogens that survive in the soil or on plant debris as resting structures, called oospores. Oospores are formed in infected plants and can survive for many years in the soil after the plant residues decompose. Oospores germinate when soil moisture is high, producing sporangia which can germinate directly and infect the root or can produce zoospores, tiny, motile spores which are released when soils are flooded or saturated. The zoospores are attracted to the germinating seed or roots by plant exudates. Phytophthora and Pythium damping off and root rot diseases are most common in fields or areas of fields with poor drainage and are spread within and between fields by irrigation water carrying infective zoospores or through oospore infested soil moved around on farm equipment. Prevention is the best cure for damping off and root rot caused by Pythiums or Phytophthora. Planting high quality seed treated with a fungicide containing metalaxyl or mefenoxam into a well prepared seedbed can provide some early protection. However, by the time the above ground symptoms of disease are evident, control is difficult and yield losses are inevitable. Re-seeding in infested fields often results in the re-occurrence of stand failure due to subsequent infections. Management of damping off and root rot of alfalfa caused by Pythium or Phytophthora requires a multifaceted approach. Plant in fields with good drainage and no history of the root rot pathogens. Plant cultivars recommended for your area that are resistant or highly resistant to Pythium or Phytophthora. The use of high quality seed that has been treated with fungicides has been demonstrated to control seedling blights and early root rots. Crop rotation away from alfalfa for at least two years is highly recommended. Alfalfa should follow corn or small grain in rotation, avoid continuous alfalfa cultivation. Fertilize newly seeded and established stands of alfalfa to promote vigorous growth and good root development.